Virginia has “real” winter and my San Diego kids get a bit stir-crazy being trapped inside. Therefore, I’ve been collecting ideas for indoor activities. 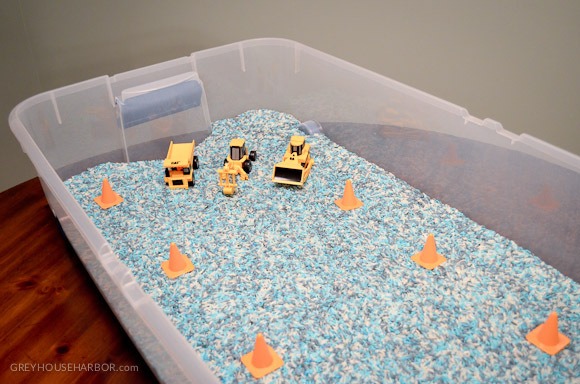 I have never been a big fan of sandboxes (two words: neighborhood. cats. 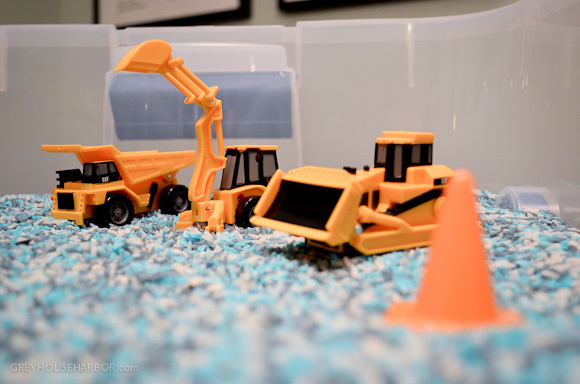 ), but a box full of colorful rice to dig in looked like fun! 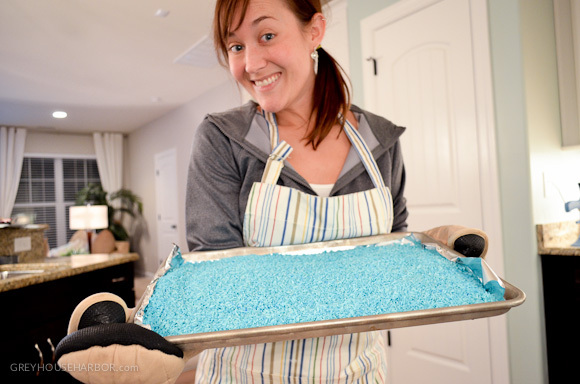 Add dry uncooked rice, vinegar, and food coloring to the ziplock. For every 1 cup of rice, add 1 tablespoon of vinegar. I was coloring 20 lbs of rice, so I worked in 5 cup increments. The more food coloring drops, the more intense your color will be. I only had these gel food colorings on hand which come out more in a spurt than drops, so it’s hard to judge just how much I used. 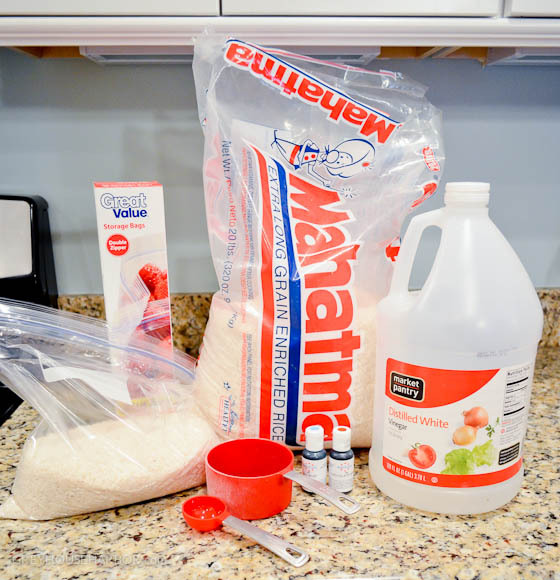 Seal the bag and knead rice until all the color is evenly absorbed. 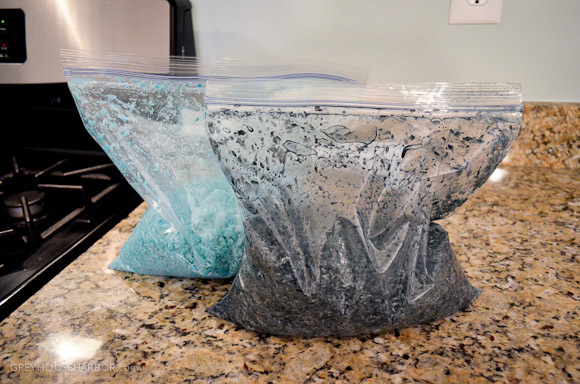 Use a separate ziplock for each color. 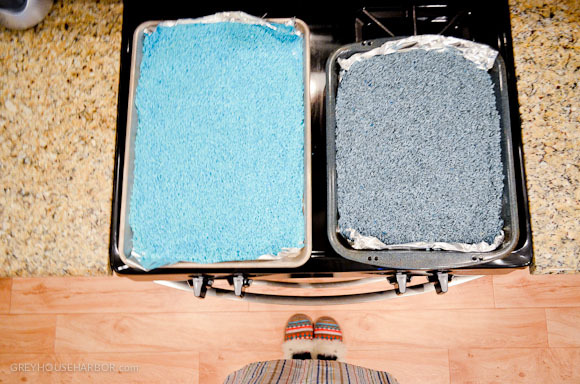 Line a baking sheet with foil and spread the damp rice evenly. You can either let it air dry for an hour or pop it in the oven at 175º for 20 minutes. And yes, those are my lucky late night crafting slippers. 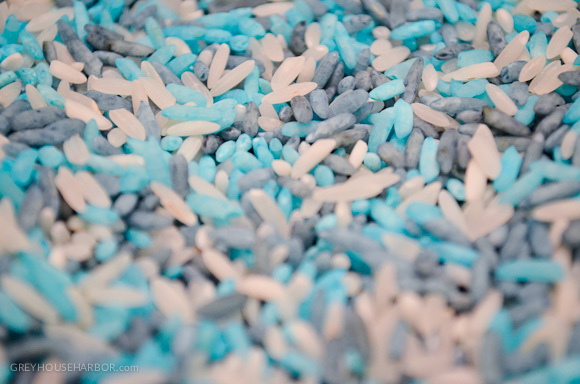 I ended up dividing the rice in thirds: bright blue, navy blue, and white for a speckled appearance. 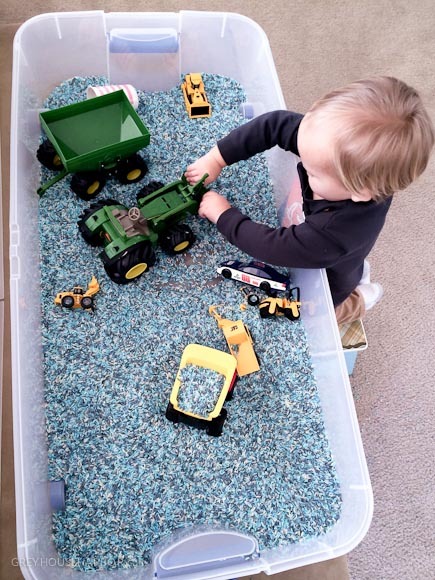 Dump all the dried rice into your play container and allow it to “breathe” overnight. I got this long, shallow underbed box with lid for about $20. – Limit the toys to small things, cups, and spoons. I spent 25 minutes disassembling one of Bug’s large diggers and picking rice out of it’s internal mechanical gears. 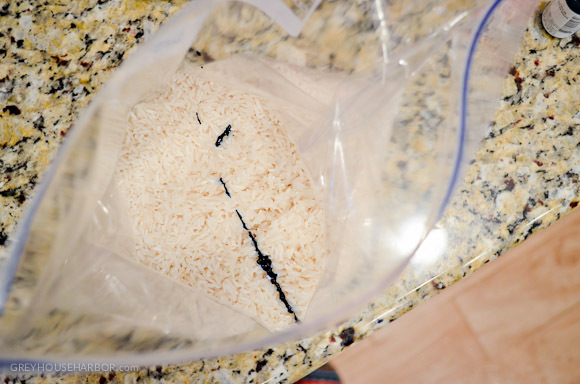 – Less rice ends up out of the box if it’s at chest level, as opposed to on the floor. We put ours on our upholstered ottoman. – It will get everywhere, but the color does not come off on hands or carpeting. I usually salvage what I can with my dustpan and the rest vacuums up easily enough. I don’t think my carpet has ever seen this much vacuum action. A small price to pay for hours of indoor fun!